Beautiful Los Angeles flowers are easy to find with Teleflora! Our brightly colored blossoms, potted green plants and gift baskets are hand-delivered throughout Los Angeles County and beyond. When you order flowers delivered to Los Angeles from Teleflora, you can be confident you’re sending the very best. 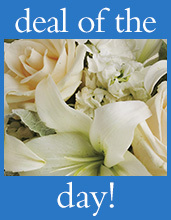 Teleflora offers fresh floral arrangements for any occasion, from anniversary flowers to new baby arrangements. Teleflora specializes in get well flowers delivered to hospitals throughout Los Angeles including UCLA Medical Center and Cedars Sinai Hospital. We’ve been serving Los Angeles for 75 years. If you are looking to send funeral flowers to Los Angeles, you can trust a Teleflora florist to deliver a tasteful arrangement. Local Los Angeles flower shops can deliver to Forest Lawn cemetery or send a Memorial Day arrangement to Los Angeles National Cemetery in Westwood. Our experienced floral designers in California are committed to quality and service and will arrange a fresh floral arrangement of Los Angeles flowers or a specialty basket to celebrate any event. So whether you are looking to send birthday flowers or to send funeral flowers and your condolences for someone’s loss, sending flowers will do the trick. Although you may not be in Los Angeles yourself, your recipient will appreciate your gift of flowers. And with Teleflora, you can order online and let us handle the details.